This paper endeavours to offer policy perspectives on international relations between South Africa and other countries in general and South Africa and the Netherlands in particular. More specifically, the paper looks at South African Dutch relationships against the historical background on the one hand and current research priorities for South Africa on the other. The paper, first of all, offers a number of propositions that will guide the remainder of the paper. 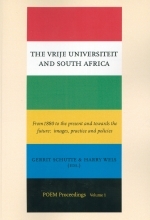 In the second place, a listing is offered of some notable South African scholars and leaders with Dutch connections. Some of the characteristics of the South African research and development (R&D) system are next offered, followed by main challenges faced by that system. The fifth section deals with its comparative strengths and weaknesses. In the sixth section different sets of priorities are given after which the paper looks at different aspects of international R&D cooperation. The paper concludes with a number of recommendations for the future. Two background notes may be in order at this point. 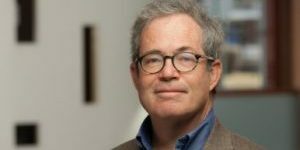 The analyses in this paper are mainly informed by the author’s exposure to international collaboration (for instance, the collaborative study undertaken by the Vrije Universiteit and the Human Science Research Council on social movements), interpretations of national policy and priorities, and exposure to the business of a national advisory council. Finally it is necessary to say that this paper focuses on science, technology and innovation, more particularly on research and development, with an emphasis on the social sciences and humanities. The following limited set of propositions guided the composition and analyses in this paper. – Academic exposure to the Dutch Higher Education and Science and Technology systems in the past contributed substantially to both the emergence of a democratic dispensation and also to scientific excellence in South Africa – and it will hopefully in future contribute to both. – The democratisation of South Africa has brought in its wake the potential for full participation in the global research and development network, including training, collaborative research, international funding for research, access to opportunities – training and research – access to job opportunities, and mobility of research workers. The country still has a long way to go to realise all the potential inherent in these new opportunities. – South Africa possesses a reasonably strong science and technology system which was inherited from the previous constitutional dispensation. – There still remains, however, a number of factors that could inhibit optimistic scenarios about the future: The relative geographic isolation of South Africa, Information Communication Technology limitations, asymmetrical needs (for instance the challenge to match the need for excellence with that of capacity development), and the relatively limited financial capacity of the country. – South Africa is well placed to offer Europe in general and the Netherlands in particular unique opportunities for good quality collaboration in various fields of research and development, especially if certain conditions are accounted for. – Political science: Willie Esterhuize. – Competition for resources (ranging from the funding of primary health care, proper housing, proper secondary school education to international competitiveness in high technology). – An R&D system that is a system-in-transition and is therefore very dynamic, sometimes even turbulent (cf. the mergers in the higher education system, reducing the number of institution from 33 to 22; the reorganisation of the science and technology governance system; and the acute need for research capacity building). – A system that is largely in Mode 2 of knowledge production (see e.g. Gibbons et al. 1994 or Rip and Marais 1998), which means, amongst other things, that publicly funded R&D is in important respects priorities-guided. The consequences for self-initiated basic research should be clear. The fact that South Africa is in a strategic science mode means that a very high premium is being placed on the notion of collaboration, and that is obviously conducive to international collaboration. – South Africa has a relatively well-developed research system. Many political spokespersons have since 1994 confirmed this. A few indicators of the strength of the system are offered in a later section. – The system is subject to serious financial constraints. These constraints are related to the competing priorities mentioned earlier, as well as the emphasis been placed by the country’s National Treasury on criteria for the funding of new programmes, namely outcomes and even increasingly on the possible impacts of such programmes. Against the background of the preceding characterisation of the South African Science and Technology system the following are some of the major challenges to that system. Firstly, South Africa has to create an optimal level of stability in the system. Currently, the mergers in the higher education system generate unproductive turbulence and one cannot expect an increase in the productivity of researchers until that has settled. In this regard it should be noted that the university system accounts for approximately 25 per cent of research output. Secondly, and of critical importance, is the need for effective research capacity development. All research and development indicators point to the dire need for new or novice black researchers to enter the system and to start contributing to it. The problem currently, it would seem, is not the fact that ageing white male researchers are responsible for the larger proportion of publications in the country (45 per cent in 1998 older than 50 years of age; NACI 2002) but the fact that there is not a sufficient inflow of young black and women researchers. Thirdly the country is being faced with rapidly ageing equipment and research infrastructure. On the one hand a proportion of equipment is rapidly ageing, but on the other hand there is also the suggestion that coordination, cooperation, and collaboration with regard to existing equipment could be improved. 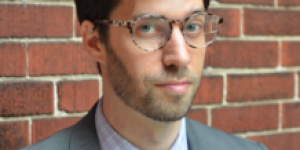 Fourthly – and as already implied earlier – there is a dire need to improve the conversion rate of research into innovation (that is, technology, problem solutions, etcetera). As has been said, given the relatively restricted resources at the disposal of the research community, more of that research output should find its way towards the solution of the many and varied challenges confronting the country. Attention should be given to a sensitivity to the need to accelerate the conversion from research to some form of implementation. Fifthly, the climate for research by the business sector must be improved. Currently, the country lags behind other countries with regard to the incentivisation of research and development by the business sector. Examples include the lack of tax incentives, the relatively vulnerable intellectual property rights security, and the relative lack of incentives for university-business collaboration. The importance of this challenge cannot be sufficiently emphasised, since the business sector is generally seen as the crucible of converting research into innovation – a driver of the growth rate and improvement of the quality of life of all South Africans. Finally, and cross-cutting the above five challenges, is the need to technologise society. South Africa is essentially, as government often emphasises, a dual economy. The term here refers to the fact that there is a highly developed and industrialised modern economy on the one hand and a developing, even underdeveloped, economy on the other. If the divide between these two cannot be bridged, the science community would be unreasonable to suspect significant increases in R&D investment. Research and development, technology and innovation should be seen to benefit the have-nots, i.e. the deprived members of the second economy, otherwise scepticism about the so-called benefits of investment in research and development could be expected. The preceding paragraphs offered a selective qualitative overview of the nature of the science and technology system in South Africa. 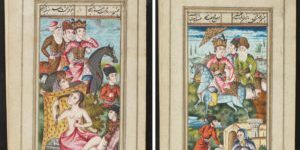 In this section, some of the qualitative comments are translated into comparative quantitative data – a few ‘hard’ stepping stones across the qualitative stream, as it were. For this purpose, two comparator countries have been chosen that represent extremes on the international scale, viz. the Netherlands and Senegal, while seven quantitative indicators are summarised in the following table (cf. e.g. DST 2005; UNDP 2002). – First of all it should be noted that South Africa is far from obtaining the magic 1 per cent of GDP spend on research and development (GERD). Although there is a slow upward trend (from 0.76 in 2001/2002 to 0.81 in 2002/2003) and a target has been set to reach 1 per cent by 2008. In comparison, the GERD of the Netherlands is more then twice that of South Africa. – Secondly it should be noticed that the productivity of the South African research community is proportionally much lower than that of an industrialised country such as the Netherlands, even when the data are normalised. 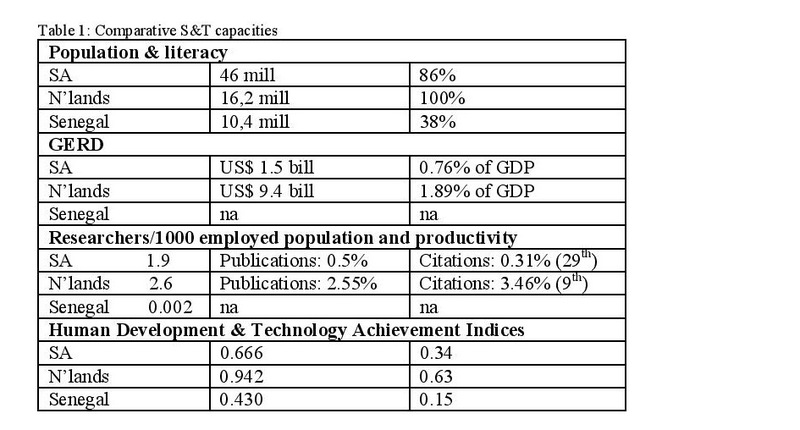 – A very significant international indicator of capacity and also of S&T performance is that of the Technology Achievement Index: South Africa is far lower than industrialised Netherlands, but significantly higher than a developing country, such as Senegal. In terms of these indices the Netherlands is ranked eighth, South Africa as 107th and Senegal as 154th . Put together data such as these show that South Africa has a well developed system for an African country, but still lags far behind industrialised countries. To keep the implications of these and related figures in perspective requires that we remind ourselves that the literature indicates a strong positive correlation between science and technology on the one hand and economic and social development of a country on the other. In this regard, a reference to what King, the science advisor of the British Prime Minister, recently said: ‘…sustainable economic development in highly competitive world markets requires a direct engagement in the generation of knowledge’, and he went on to show ‘…the cycle of poverty and dependence [that is in developing countries] will only be broken by capacity building between nations of high and low science intensity often characterised as the North and the South’ (2004: 403). The message is very clear, namely to enhance South Africa’s economic and social development requires the intensification of its science and research endeavours – in this regard one of the obvious instruments is that of international collaboration. Through cooperation between South African and the Netherlands, South Africa stands a better chance to further accelerate its research and development capacity and thereby raise its economic growth. Talking about research priorities might come across as a rather strong form of research steering. However, it is necessary to recall that the South African Research and Development System is currently one that is priorities-directed. The missions of most South African research institutions currently specify explicitly that the research agenda should be aligned with national priorities. Obviously this is a contestable area, yet it is a reality within which South Africa operates. I would like to start with the national priorities of central government followed by the South African Research and Development Strategy (NRDS) and its priorities, thirdly the priorities that guide NACI currently and, finally, the NEPAD priorities. All of the above, however, in the full realisation that a government’ priorities are by definition political in nature and that that such priorities are very broad. The so-called national imperatives that government promote are driven by the need to link what is called the first and second economies of the country. That literally means to have the underdeveloped – mostly deep rural communities – share in the benefits of the developed economy. More specifically the following imperatives are promoted. – Appropriate responses to globalisation. The key document directing publicly funded research and development in South Africa is currently ‘The National Research and Development Strategy’ (2003). A summary of the priorities covered by the strategy is summarised below. – Leveraging resource-based industries and developing new knowledge-based industries from them. Our ability to respond [to new areas of technology] is not simply depended on having the technological capacity available. There is a particular need to mobilise the social sciences to develop far more holistic understandings and interventions to improve the rate of innovation in our society. The role of the social sciences is often underestimated, and it is therefore necessary to develop specific capacities in the social sciences to understand and strengthen our system of innovation (2003: 38). Indeed, a tall order for the social sciences but at the same time one which they surely should take up. – The state and scope of ethics in the national system of innovation. Since the establishment of a science and technology secretariat within in the New Partnership for Africa’s Development (NEPAD) structures a number of so-called flagship programmes have been identified and are currently being operationalised. These priorities or flagship programmes fall, with a few exceptions, clearly in the realm of the hard sciences. Nevertheless, the social sciences and humanities could in partnership with natural scientists and engineers make a meaningful contribution. For instance, in the case of energy technologies the whole question of pollution and human behaviour with regard to energy conservation comes into play. The same would apply to desertification where agricultural practices are a factor in the encroachment by the desert. This chapter has so far dealt primarily with the South African situation and has moved towards specific priorities with regard to which there is a national need for R&D. This section of this chapter looks at the pros and cons, respectively the opportunities and the threats to international collaboration. Table 2 summarises some of the opportunities and the threats to such cooperation. A close study of the self-explanatory table shows that the opportunities are primarily those concerning the broadening of scientific horizons, in either the form of participation in an international context or by cross-validation of such studies. Seen from a different perspective, the challenges focus more on what could be called programme management and human aspects of research. If there is a message hidden in the previous sections of this chapter, then it is a call for the extension of Dutch involvement in collaboration with South African universities and research institutions. South Africa certainly needs Dutch cooperation, but the chapter implies that Dutch research can also profit and benefit from collaboration with their South African counterparts. One condition for such cooperation and collaboration is to have such collaboration preferably be centred around South African priority areas. It would be fair to say that the priorities mentioned earlier in this chapter offer a very wide range of topics for which there should be serious interest from Dutch colleagues. This point relates to the argument that such research should at least take account of a Mode 2 design. That, of course, does not imply that the quality of such research should be suspect in any way. To the contrary, an assumption of this chapter has throughout been that international collaboration should entail high quality research. An important implication of the analyses so far is that a distinction should be made between knowledge generation in its own right and research capacity development, i.e. training of novice researchers. We cannot simply assume that a research project will necessarily contribute to research capacity development. Our experience has so far shown that one has to explicitly manage capacity development as an additional and a unique function attached to research. Indeed, funding agencies should explicitly require a plan to show how a project would contribute to capacity building. Another guideline that is also emerging from the above analyses is that we should preferably invest in larger and multi institutional programs rather than small individual projects. This is not to say that the latter should be ignored. However, an important project of NACI (2003) has convincingly shown that larger projects have a significantly better chance of getting implemented and utilized than small projects. And that is what strategic science and Mode 2 are all about. And this means that research partners should plan for meaningful outcomes and impacts from the start of collaborative ventures – it should not be a postscript, an afterthought. All of the above adds up to the need for professional project management skills and approaches. In fact, it would be a truism to say that the larger the project and the more participants in such a project, the more challenging the management challenges become. In conclusion I would like to raise a number of strategic, respectively ethical questions. When planning international collaborative ventures we should ask ourselves at least the following questions and obviously also have sound and defendable answers to them. 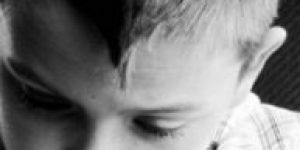 – What would we leave behind upon completion of the project? – What and how would we contribute to the development of South Africa in general and the particular field or community in particular? – How sustainable would our project involvement be? Or will it be a once-off effort and excuse to spend some time in Africa? – What would we take back in terms of learning experience? Would we be able to transfer the skills to our students back home? – Is it part of a larger program or incidental personal project-in-a-different-context? – Would we be prepared for a thorough program evaluation upon its completion? To put it rather starkly, would our study stand the light of thorough program interrogation? – Both South Africa and the Netherlands can profit from intensified engagement and this is not only for historical reasons but in the spirit of globalisation the nature of Mode 2 of knowledge production and the spirit of this particular workshop. – South Africa has indeed elevated international collaboration to a priority at national and institutional levels. – Ideally, projects should be located within an innovation value chain – this is also a context in which the social scientist can make essential multi-, inter- and trans disciplinary contributions. – Larger projects and programs are preferable to small and incidental ones. – It is essential to explicate the expected value addition by the collaborating partners rather than just engaging in a program of which the outcomes are not clear at the start. – Collaborative research and development programs pose project management challenges that cannot simply be left to chance or default options. – Collaborative programs should be evaluated on a regular basis. [i] Edward Rakate and Ria Vogel are thanked for their assistance in the preparation of this paper. [ii] The National Advisory Council on Innovation (NACI) is a South African statutory advisory body, established in 1997 to advise the Minister of Science and Technology and Cabinet on all matters pertaining to innovation, which includes science and technology. Counterparts of NACI include the Dutch Adviesraad voor het Wetenschaps– en Technologiebeleid (AWT). Department of Science and Technology (2004) National Survey of Research and Experimental Development [R&D], 2001/2 fiscal year, Cape Town: DST. Gibbons, M., Limoges, C., Nowotny, H., Schwartzman, S., Scott, P. and Trow, M. (1994) The new production of knowledge. The dynamics of science and research in contemporary societies, London: Sage. King, D.A. (2004) ‘The scientific impact of nations: What different countries get for their research spending’, Nature 15(July). Mouton, J. and Muller, J. (1995) ‘A typology of shifts in intellectual formations’, in U. van Beek (Ed. ), South Africa and Poland in transition: A comparative perspective, Pretoria: HSRC, pp. 163-97. 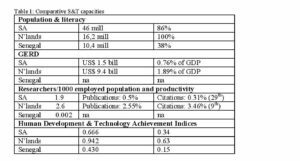 National Advisory Council on Innovation and Department of Arts, Culture, Science and Technology (2002) South African science and technology: Key facts and figures, Pretoria: NACI. National Advisory Council on Innovation (2003) Utilisation of research findings: Extent, dynamics and strategies, Pretoria: NACI. Rip, A. and Marais, H.C. (1998) ‘Assessing university research under conditions of changing knowledge production’, SAUVCA Publication Series 98(2): 1-22. UNDP (2002) Human Development Report 2002: Deepening democracy in a fragmented world, New York, Oxford: Oxford University Press.